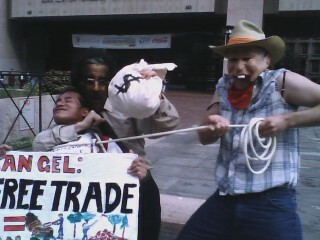 On Monday, October 1st at 9AM, members of the New York City People's Referendum on Free Trade held a protest at Charlie Rangel's office in Harlem's Adam Clayton Powell State Office Building to protest his role as the architect of democratic support for the Peru Free Trade Agreement. The crowd of about 13 protestors included Rangel constituents and members of Wetlands Activism Collective, the Movement for Peace in Colombia, Global Justice for Animals, the New York Committee in Solidarity with the People of El Salvador, Health GAP (Global Access Project), Polo Democratico Alternativo USA (NY/NJ/CT chapter), and Cowboys Against Bush. Media on hand included Bill Moyer's Journal and the Amersterdam News, a NYC African American newspaper. The protest centered around a street theater performance that began with Rep. Rangel giving an impassioned speech against CAFTA and the Oman FTA, expressing his commitment to putting the public interest before corporate profits. Cowboy Bush, played by performance artist Telfair Cardaci of Wild West Entertainment, entered stage right, and in an aside to the audience commented "Looks like I'm gonna need to wrangle Rangel." He proceeded to lasso Charlie pull him up close and explain to him the vast bounty available to him as Chair of the House Ways and Means committee, so long as he cooperated with Bush's "good friends." Bush introduced Rangel to his good buddies, the corporate lobbyists. Pfizer's explained to Rangel why his company needed a Peru FTA to protect their intellectual property and pull generics off the market. The lobbyist from Occidental Petroleum explained why his company needed a Peru FTA to ensure its access to the Peruvian Amazon unimpeded by environmental protections. Bush and the lobbyists then proceed to a series of dastardly deeds. Cowboy Bush lassoed a prescription drug bottle out of the hands of an HIV positive Peruvian, who they taunted with comments like "We got the money, you get to die!" 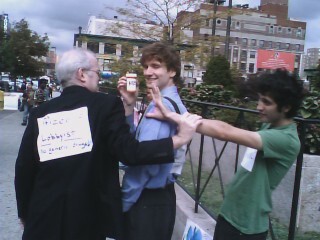 Oxy's payoff was next, as Rangel brutalized an indigenous protestor tore down his protest sign, displaced him, and erected with Bush a leaky Amazon oil pipeline. Satisfied with a job well done, the politicians and lobbyists danced, exchanging partners frequently, while singing So Happy Together. 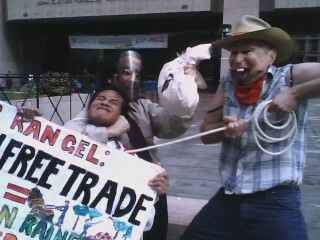 Rangel's trade deal is outrageous!" 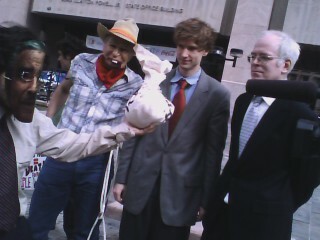 Next, activists gave speakouts denouncing the FTA. Nicholas Chango, an activist for the rights of Andean indigenous peoples, talked about how the deal with harm indigenous communities. Alex Reid Ross of Global Justice for Animals addressed the threat to public health, animal welfare, and the environment the agreement represents. After the protest, Adam and Alex dropped into Rangel's office and had a meeting with his press representative, expressing their concerns that despite the agreement's new environmental provisions were of little value and that the agreement was overall disastrous for animal welfare, threatened ecosystems, and indigenous communities.